Single word descriptions of Basel don’t do this Swiss city justice. 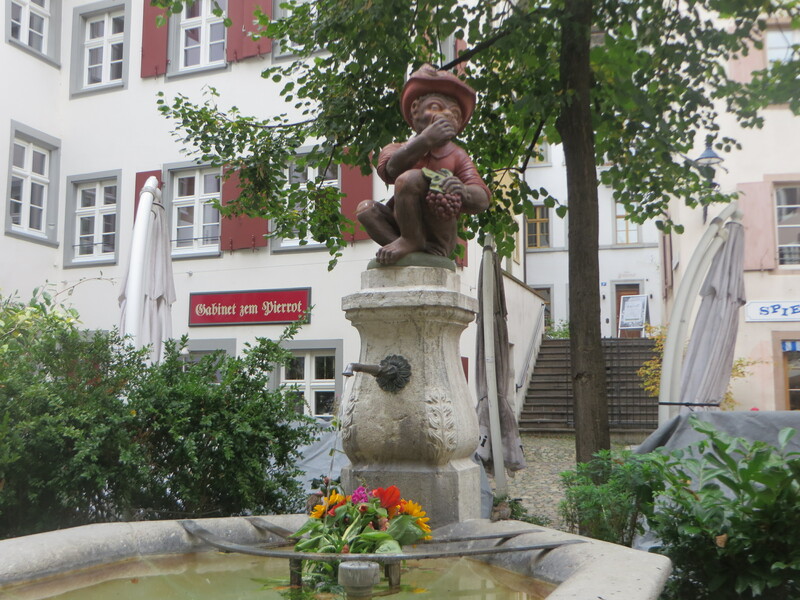 Titles such as “Cultural Capital of Switzerland” or “Oldest University Town” barely scrape the surface when trying to characterize this eclectic and exciting town. 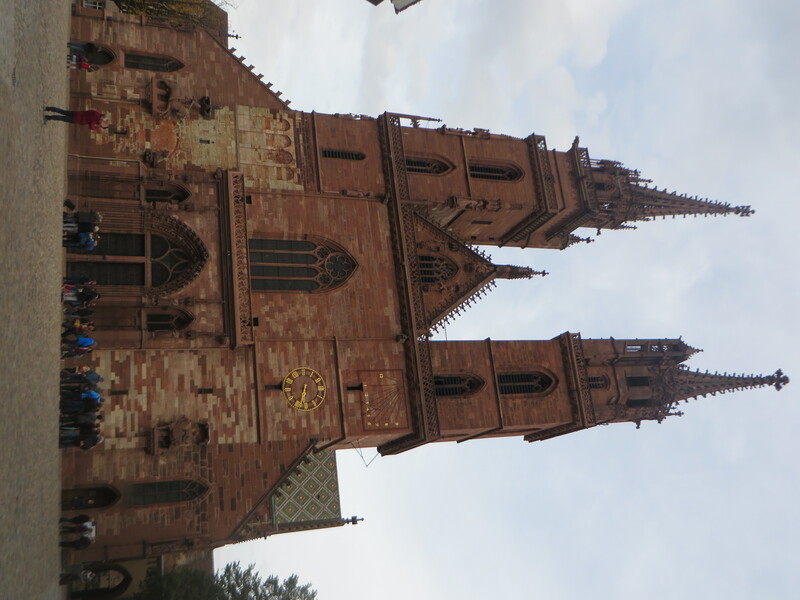 Attempts at encompassing the rich variety of cultural and historical sights, as well fun leisure activities available in Basel under one heading are simply futile. Resist the impulse to box this city in; instead, give yourself free rein to use as many terms as necessary to showcase this exhilarating destination. Location wise, Basel can’t be beaten. It’s a central transport hub for Europe and lies on a three-country cornerstone or tripoint where Switzerland, Germany and France meet. The city is very accessible, as there are a variety of options whether you come by plane, rail, boat, car or even bicycle. Once you’ve arrived, exploring the town is easy with its many trams and buses, but you’ll probably want to do most of your meanderings on foot in order to fully experience the charms of this alluring locale. You’ll soon discover that although Basel is a small town with less than 200,000 people, it has a big city feel due to its world class attractions and high quality of life. 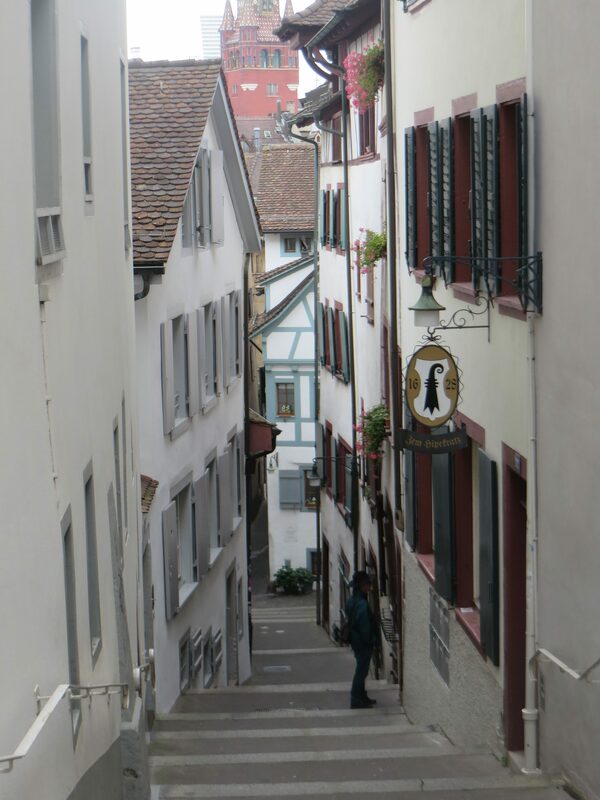 Basel can look back on over 2,000 years of history, which continues to be alive and well today within the city’s quaint Old Town, at its numerous museums or among its storied traditions. 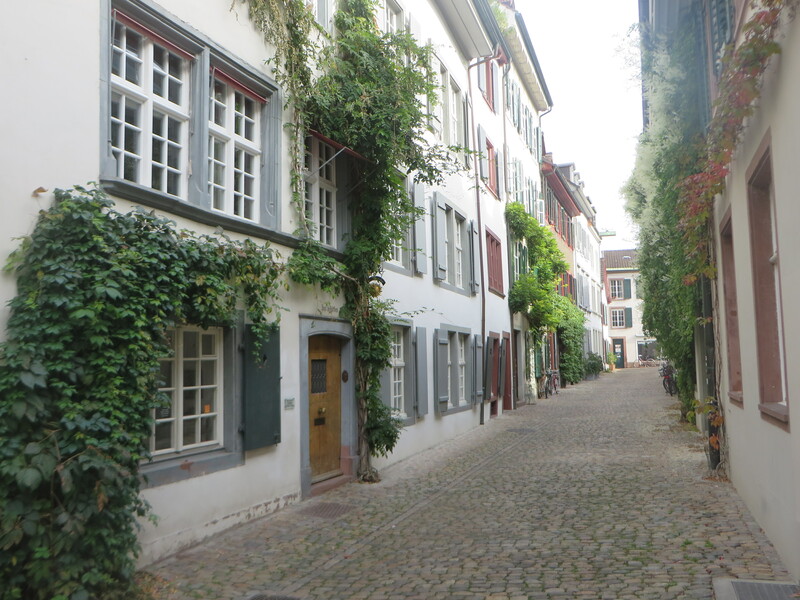 The narrow alleyways and hidden squares of Old Town lead to splendid 15th century buildings and eye-catching sights, making this section of Basel one of the most beautiful and intact of its kind in Europe. The city’s beloved landmark is the Cathedral, a Romanesque and gothic style behemoth of red sandstone that dates back to the 12th century. Erasmus, the famed Dutch Renaissance humanist, Catholic priest, social critic and theologian, is buried here. Make sure you climb up to the observation platform, where you can enjoy a spectacular view overlooking the Rhine. Spend time in the square around the church, as it’s a great spot to people watch or catch one of the town’s many festive events. Also in the midst of Old Town is City Hall, the seat of the Basel government and its parliament. You can’t miss the building with its bright red façade, characteristic tower and playful frescoes. Step into the courtyard for a glimpse of the imposing statue of Munatius Plancus, the founder of the first Roman settlement in the region. 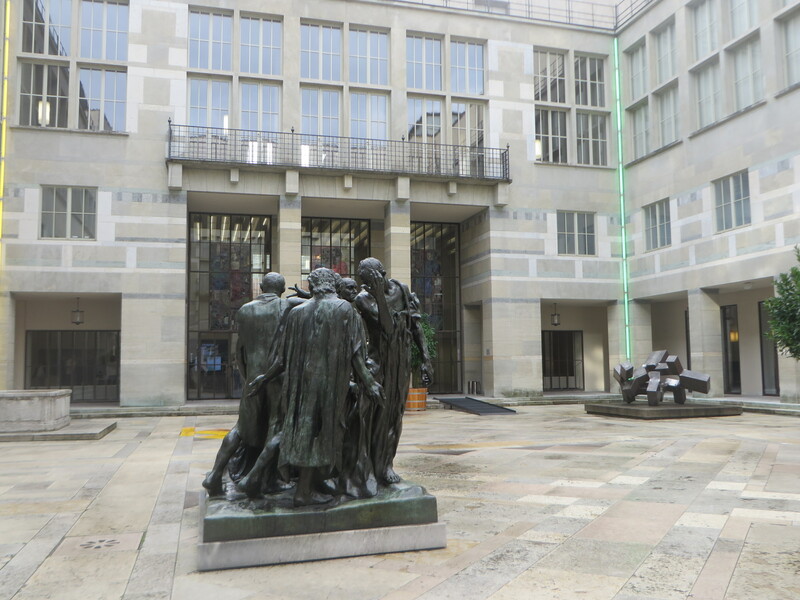 If you’re curious about the inside of this historical structure, opt to take one of the regularly scheduled tours of the place with Basel Tourism. 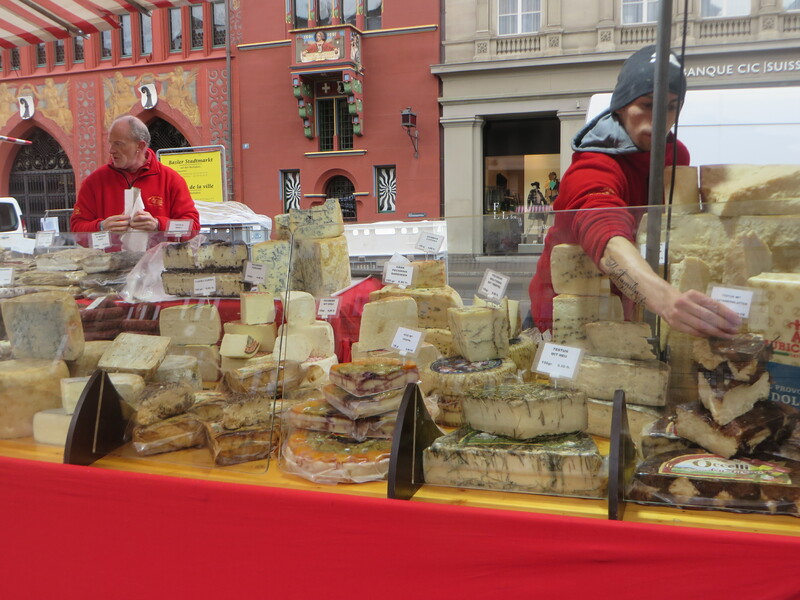 Then meander the stalls around the piazza out front, which is called Marktplatz. There you’ll find fresh flowers, produce and specialties from the region. It’s a popular shopping spot for residents, and for visitors, it’s a treat to check out (and sample) local goods and delicacies. The selection of cheeses is mind-boggling, as is the array of different kinds of bread, honey and wine. It’s impossible not to notice the many fountains that dot this picturesque town. There are 314 in total and all have clean drinking water with the exception of one. You’ll see folks filling their water bottles from these works of art or simply quenching their thirst right on the spot. Each of the fountains is distinct in design and size. 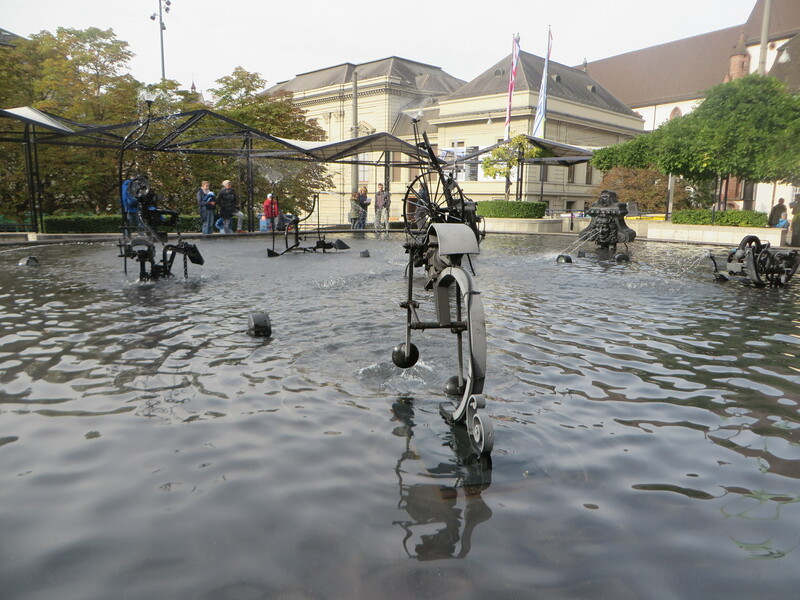 The most famous is the Tinguely Fountain, designed by the Swiss artist Jean Tinguely. It’s located on the site of an old theater and constructed with pieces from the theater’s stage to create ten distinct elements, all of which operate through complicated movable metal mechanisms. In summer, the fountain sprays water; in winter, it becomes an enchanting ice sculpture. With its central location, it’s a magnet for both Basel inhabitants and tourists alike. Another fountain of note is the Trident Fountain, as each New Year’s Day, courtesy of the Guild of the Golden Star (comprised of medical professionals), it emits red spice wine that the public is free to drink. Everywhere you look you’ll see outdoor works of art installed on street corners and in alleyways or adorned on bridges and buildings. Serra, Borofsky, Rodin and Niki De Saint Phalle are only a few names of the artists who have contributed to sculpting the cityscape with their creations. You’ll also notice numerous basilisks, Basel’s heraldic animal, which reportedly was a monster with the head and claws of a rooster, the beak of an eagle and the tail and wings of a dragon. The creature wasn’t named for Basel nor was Basel named for the monster. The word “basel” is from a Greek word meaning king. The basilisk was called the king of serpents because he was so lethal and because of the rooster crown on his head. When it comes to museums, Basel boasts nearly forty institutions, the highest concentration in Switzerland. With varied themes, there’s something for everyone, from art lovers and history buffs to science and technology enthusiasts, fashion mavens, sports fans and music aficionados. A visitor could spend days soaking in the wonder of grand masters and marveling at the unusual displays of many others. Among the leading art institutions in the region is the Kunstmuseum Basel, which is a conglomeration of three buildings. The main building contains a strong representation of Flemish paintings and drawings from 1400 to 1600, along with 19th to 21st century art. A new hall, which just opened last April, stands out for its unique architecture and state-of-the-art galleries. Designed by Basel architects Christ & Gantenbein, it features selected pieces from the museum’s treasures, along with special exhibitions such as the one currently on display, “The Figurative Pollock.” This well-curated exhibit focuses on Jackson Pollock’s figurative oeuvre from a chronological approach. Nearby is the third building showcasing rotating contemporary art from the permanent collections of the museum and the Emanuel Hoffmann Foundation, as well as major special exhibitions of such artists as Cézanne, Cy Twombly and Joelle Tuërlinckx. Beyeler Foundation, Basel’s best known art museum, was designed by the prominent architect Renzo Piano. Its legendary collection contains over 300 masterpieces of modern and contemporary art, including works by Picasso, Monet, Matisse and Giacometti, as well as Andy Warhol. Those who visit the museum this fall will be treated to the comprehensive exhibit, “Kandinsky, Marc & Der Blaue Reiter,” which provides an in-depth look at works by Wassily Kandinsky and other avant-garde artists whose openness and internationalism were interrupted by the First World War. One of the more unique museums in Basel is Museum Tinguely, which houses the world’s largest collection of works by the artist Jean Tinguely. 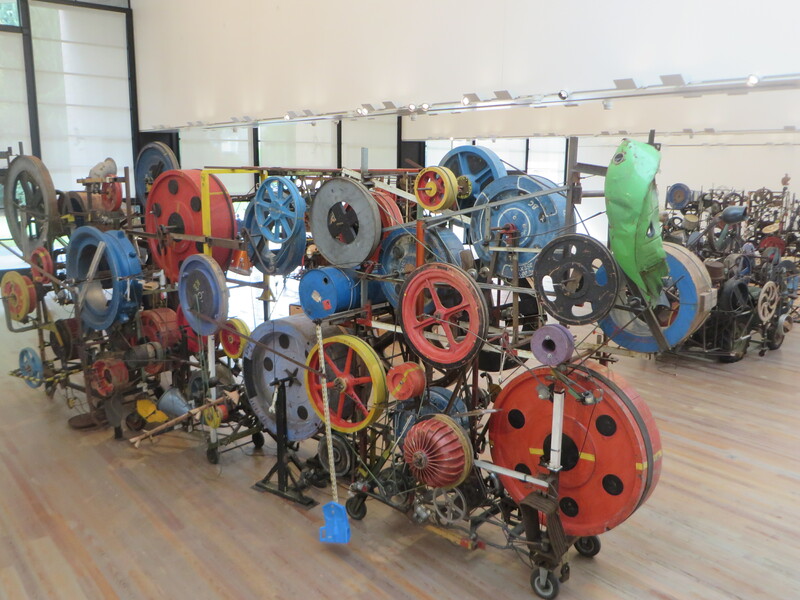 Known for his colorful kinetic sculptures made from pieces of rubbish, Tinguely’s pieces overflow with wit, irony and poetry. They rotate and flash, while making a series of sounds from rattles and squeaks to bangs and thumps. Visitors of all ages are entranced by this whimsical and mesmerizing art. Another of my favorites is the Hooseagg or Pocket Museum. It’s the smallest museum in the city and actually consists of just a window in the door of a private residence in Old Town. 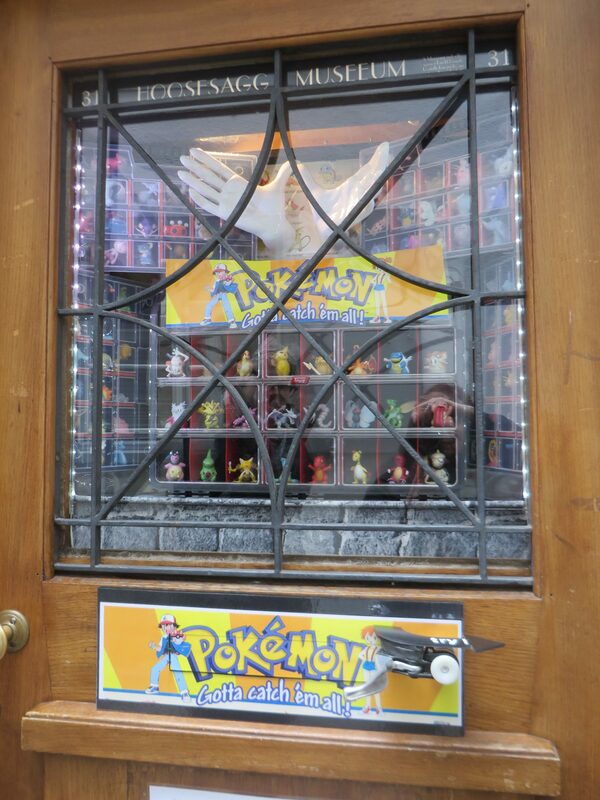 The door is along the route of many walking tours and the owner of the place grew tired of people peering inside as they went by, so she created a tiny museum in the window to give folks something to view. The exhibit changes every so often and has featured everything from Easter eggs and “Lion King” collectibles to chess pieces, red emergency vehicles and Pokémon figures. The only stipulation for the displays is that the items must be small enough to fit into the pocket of a pair of pants. 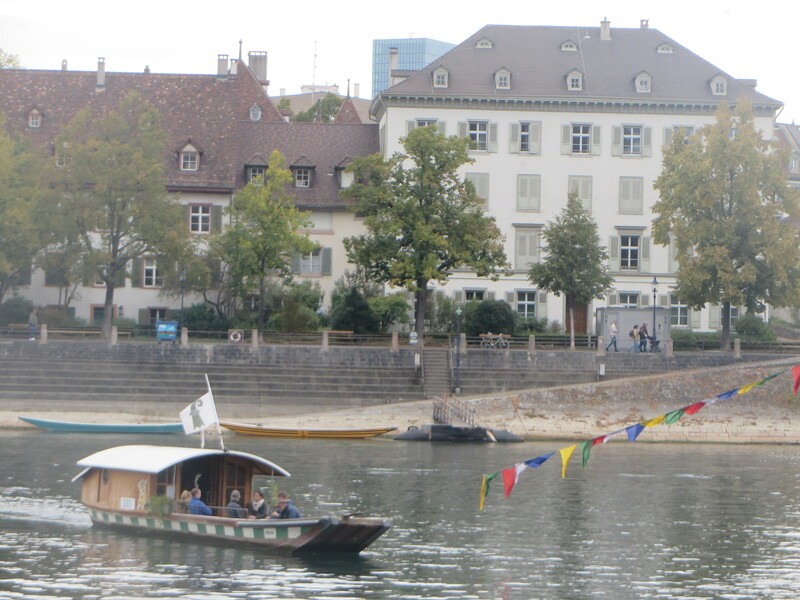 As you stroll through the city, you won’t be able to avoid the Rhine, which divides Basel into its two sectors. Or better said, it connects the two halves of the town. Cyclers and walkers make good use of the well-established paths along this popular recreation area. The walkways are lined with half-timbered houses and baroque residences, as well as restaurants and cafes, and in the warmer months, the masses descend to take in the scene. Then there are the swimmers who can be observed in great numbers in the summer floating down the river holding onto the Basel “Wickelfisch,” a watertight bathing sack which makes it possible to keep your clothes dry while in the water. For a flash from the past, take one of the four historic ferry boats that carry passengers across the Rhine. These small crafts have no motors and are hand-operated by tiller. They are held in position by a rope suspended above the water, while the current pushes them from landing to landing. To cross in the opposite direction, the ferrymen and/or women simply turn their boats the other way. The journey takes just a few minutes, during which time, you’ll want to soak up the stunning views. 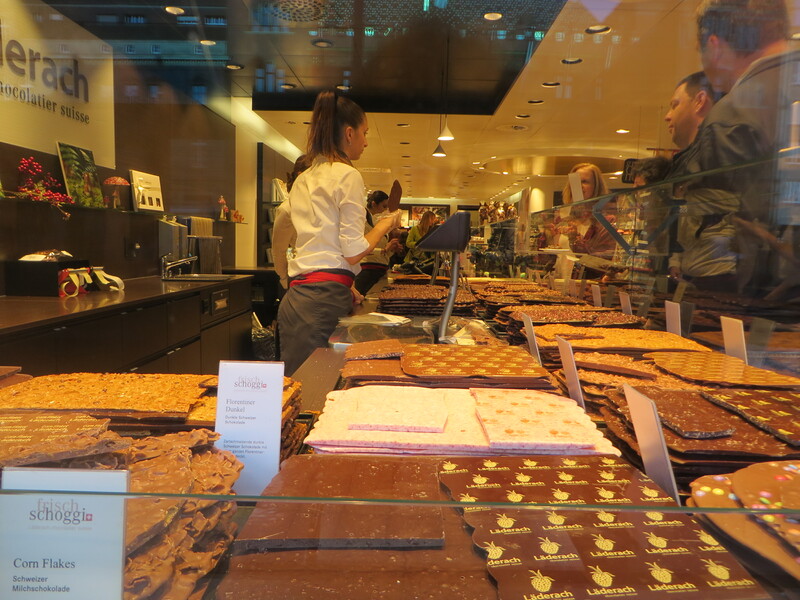 Basel is also home to many distinctive shops and boutiques. Among them is the ever-popular Johann Wanner Christmas House. Wanner, who considers himself to be the “couturier of the Christmas tree,” has everything you need to decorate for the holiday from the traditional to the avant garde. Regarded as the Coco Chanel of the Christmas tree world, Wanner’s ornaments have adorned spruces at the White House, the Vatican and Buckingham Palace. When you’ve shopped until you’ve dropped, know that sustenance is never far away. 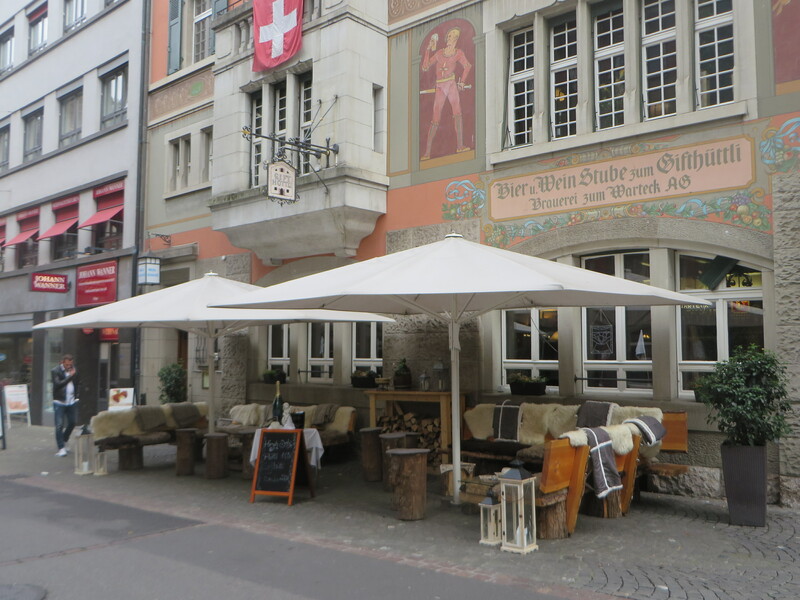 Restaurants and cafes abound offering traditional Swiss specialties, gourmet dishes, ethnic fare and casual pub grub. And for night owls, the choices are many as the city has no lack of clubs, sophisticated lounges and cozy bars. Make sure to check out Bar Rouge where you can enjoy your libations with a view high above the roofs of Basel. After an evening out, head back to your hotel. Fortunately, the city has plenty of quality accommodation options including my personal favorite, the lovely Hotel Basel, conveniently situated right in the middle of Old Town. No matter when you’re in Basel, there’s bound to be an event. The town claims to have the largest carnival in the country, the most important art fair in the world, a military music festival that is second only to that of Edinburgh in size, the top Christmas market in Switzerland and a prominent indoor tennis tournament that attracts hometown star Roger Federer along with other top players. 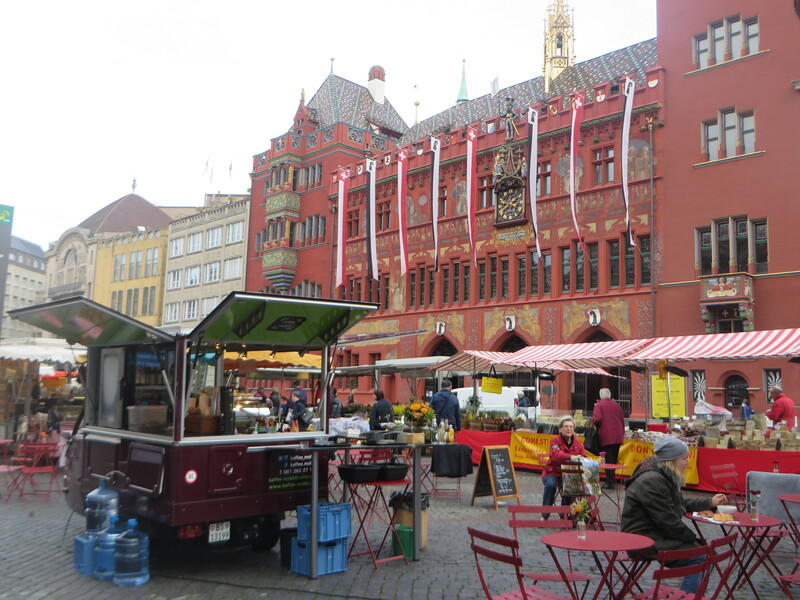 Such festivities are part of the fabric of Basel and give credence to its fun-loving populace who find any excuse to celebrate life in this grand place.